55049, Hubcaps used, 14", 01-02, HONDA, CIVIC, SPARKLE SILVER, 6 DOUBLE SPOKES, 12 SPOKE, 4 LUG NUT HOLES & ENGRAVED LOGO IN CENTER, 6 ANT-I RATTLE CLIPS. 8020, HUBCAP COPY, 15", PAINTED SILVER, 5 FAKE LUG NUTS. 10 GROOVED SPOKES. SET 55.00. 903, Hubcap CENTER USED, 92-95, Ford, Taurus, SPARKLE SILVER, BLACK WORD TAURUS IN CENTER. 5 PLASTIC CLIPS & WIRE RING, 7" DIA. 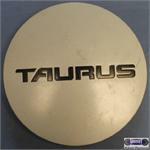 903, Hubcap CENTER USED, 92-95, Ford, Taurus, SPARKLE SILVER, BLACK WORD TAURUS IN CENTER. 5 PLASTIC CLIPS & WIRE RING, 7" DIA, FOR A 15", 8 SLOT. HUBCAP, CENTER COVER ONLY. 1089, HUBCAP USED, 13", 79-80, BUICK, SKYHAWK, BRUSHED POLISHED OUTER RING, DARK GREY PAINTED, 12 POCKETS, RAISED CENTER, BLUE BACKGROUND, CHROME WORDS SKY HAWK & BIRD LOGO, 6 METAL CLIPS. 0000L-08, HUBCAP USED, 14", 62-63, POLARA, 500, 880, CHROME WITH BLACK POCKETS, SPINNER & BLACK CENTER, METAL CLIPS. 1003, Hubcap used, 15", 67, BUICK, LESABRE, SPECIAL, CHROME FINISH, 40 SLOT TYPE, BLACK CENTER WITH FULL COLOR LOGO, 8 SAW TOOTH CLIPS. 1006, Hubcap used, 15", 67-68, BUICK, ELECTRA, LESABRE, EXCEPT WIRE TYPE, DEEP DISH TYPE, POLISHED OUTER RING, 42 POCKETS + VALVE HOLE, POLISHED WIDE RING, FINNED RAISED CENTER, BLACK BACKGROUND, MULTI COLORED THREE FLAG LOGO, SAW TOOTH CLIPS. 1012b, HUBCAP USED, 14", 1967, BUICK, SPECIAL, EXCEPT WIRE TYPE AND SKYLARK, 9 SLOT TYPE, POLISHED, RAISED CENTER, NO EMBLEM, METAL CLIPS. 1013, Hubcap used, 14", 67-72, BUICK, SPECIAL, WIRE TYPE, WITHOUT SPINNER. 1014, Hubcap used, 15", 68, BUICK, LESABRE, SPECIAL, EXCEPT WIRE TYPE AND MAG TYPE. 1015, Hubcap used, 15", 68, BUICK, WILDCAT, EXCEPT WIRE TYPE AND MAG TYPE. 1016, Hubcap used, 15", 68, BUICK, RIVIERA, DEEP DISH TYPE. 1017, Hubcap used, 15", 68-72, BUICK, SPECIAL, PASSENGER, MAG TYPE. 1018, Hubcap used, 14", 68, BUICK, SPECIAL, SKYLARK, CHROME OUTER RING WITH 39 BLACK SLOTS, CHROME MIDDLE, WIRE TYPE & MAG TYPE, GRAY BETWEEN EACH CHROME 30 SPOKE IN MIDDLE OF HUBCAP, RAISED CENTER WITH BLACK CENTER & CHROME SKYLARK EMBLEM IN CENTER. 1019, Hubcap used, 14", 68, BUICK, SPECIAL, EXCEPT WIRE TYPE AND MAG TYPE TRI-SHIELD EMBLEM. 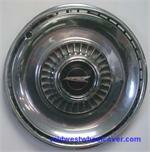 1019, Hubcap used, 14", 68, BUICK, SPECIAL, EXCEPT WIRE TYPE AND MAG TYPE; TRI-SHIELD EMBLEM. 102, Hubcap used, 14", 67, RAMBLER, AMERICAN, 5 SPOKE TYPE. 1020, Hubcap used, 14", 68-72, BUICK, SPECIAL, MAG TYPE. 1021, HUBCAP USED, 15", 1969, BUICK, LESABRE, SPECIAL, POLISHED OUTER RING, 100 RIB TYPE, FADED BLACK PAINTED RIBS, RAISED CENTER, BLACK BACKGROUND, THREE COLORED FLAGS, METAL CLIPS. 1022, Hubcap used 15", 69, BUICK, LESABRE, 60 RIB TYPE. 1023, Hubcap used, 15", 69, BUICK, WILDCAT, RIB TYPE. BLACK CENTER WITH RAISED CHROME LOGO, METAL CLIPS.